I've never considered white chocolate to be "real chocolate". Besides sweetness, it usually doesn't have much flavour, but caramelizing can take it from "one note" to "surprisingly complex". Photo by Kat Martin. To do so, combine 340g of good quality white chocolate with 1/4 cup of coconut oil in a glass baking dish and heat at 120C, stirring every 15 minutes. When the chocolate reaches the colour of a "strong latte" (about 45-60 minutes), it's done. Use in truffles, as a biscuit frosting, on ice cream, or in Bon Appetit's Coconut-Lime Snowballs. Can we put this "white Chocolate" thing in the same category as the "Hover Board", white chocolate is not bloody chocolate! Correct. The dictionary definition of chocolate is "a food in the form of a paste or solid block made from roasted and ground cacao seeds, typically sweetened and eaten as confectionery." 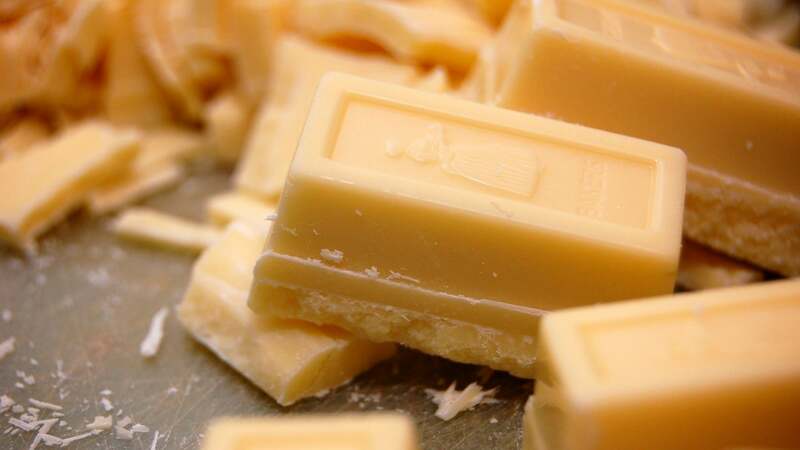 White "chocolate" does not contain any cacao. Therefore is not chocolate.